Bringing Hattie Redmond and Inez Milholland out in the open! One bulletin from Suffrage Wagon News Channel focuses on the continuing effort to bring Inez Milholland, the US suffrage martyr, to public attention. Over one hundred years have passed since her death, a turning point in the struggle of American women to win the right to vote. The National Women’s History Project set aside 2016 to acknowledge the sacrifice of Inez Milholland. Marguerite Kearns and Robert P.J. Cooney coordinated the effort. InezMilhollandCentennial.com And the centennial blog honoring Inez MIlholland continues publishing. Check it out. Oregon’s statewide commemoration of women gaining access to the vote in 2012 has many highlights, and one of them is the uncovering of the history of black suffragist Harriet “Hattie” Redmond. She was intimately involved in the campaign of 1912 by holding rallies and hosting speakers at her church, serving on the central planning committee, and registering to vote in early 1913 after Oregon’s constitution was amended. Recently Oregon State University announced that one of their buildings is being renamed the Hattie Redmond Women and Gender Center. This is part of an effort to rename campus buildings associated with slave owners and supporters of slavery at OSU. 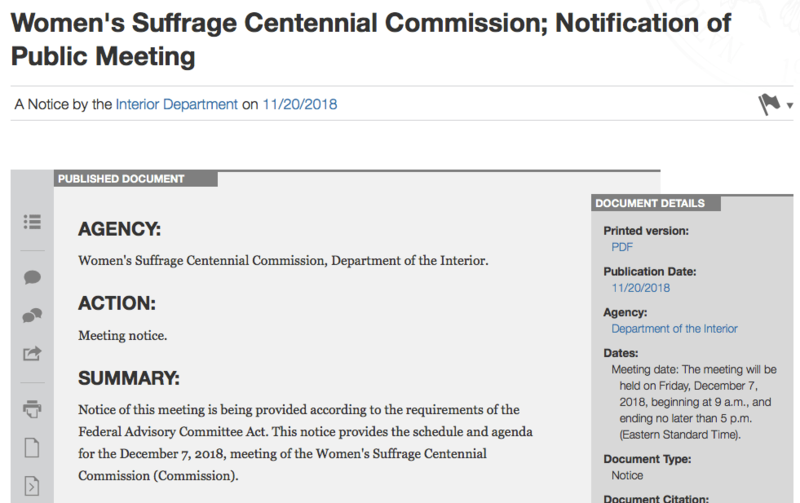 More interest than ever is being generated by the upcoming 2020 national suffrage centennial with the centennial observance of the 19th Amendment to the US Constitution. The UK is celebrating its 100th year of women voting during 2018. Follow: SuffrageCentennials.com for news and views. Celebrate women’s history on Labor Day. The amount of effort and strenuous work put into the first wave of the women’s rights movement is being recognized, finally! This entry was posted on September 1, 2018, in Blog and tagged Hattie Redmond, Inez Milholland, suffrage centennials, Suffrage Wagon News Channel. It has been a great year for the “Spirit of 1776” suffrage wagon! The “Spirit of 1776” at Long Beach,NY on July 4, 1913. 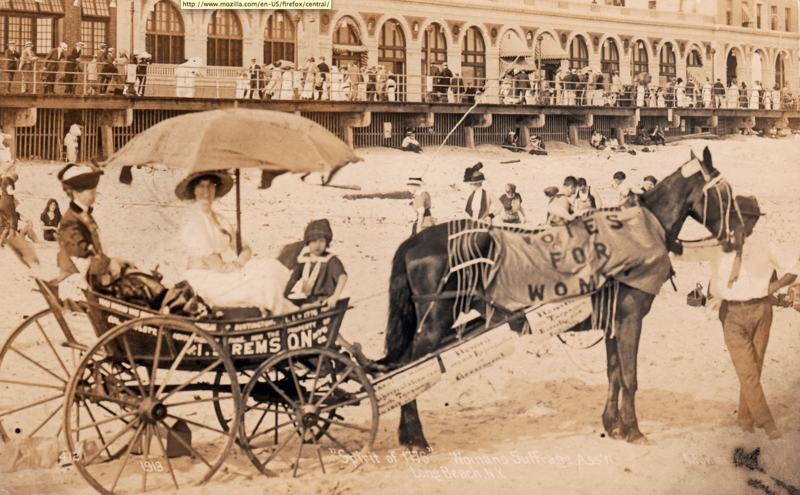 What a splendid year it has been for the “Spirit of 1776″suffrage campaign wagon used by Edna Kearns in New York City and on Long Island. The wagon was exhibited at the New York State Capitol in March 2017 and then it moved over to the lobby at the New York State Museum. The “Votes for Women” exhibition was up from November 2017 to May 2018. And the wagon was in the museum lobby greeting visitors from the state and around the world. What a terrific two years. Great job, New York State! 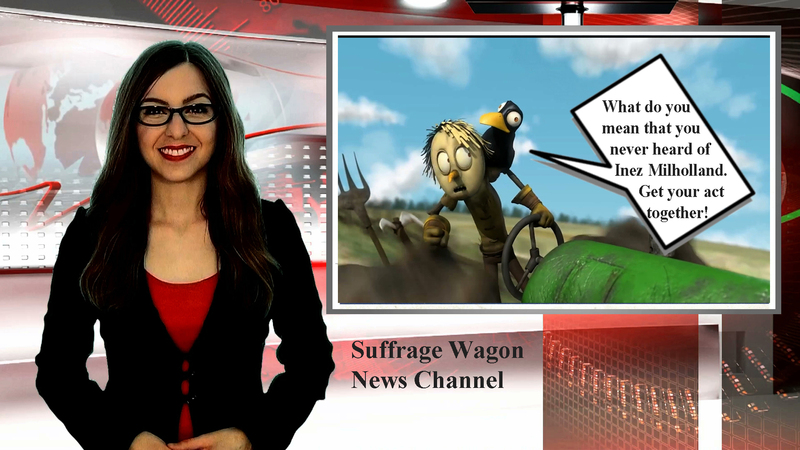 Stay tuned for new developments at Suffrage Wagon News Channel. Meanwhile, Suffrage Centennials keeps plodding along. This entry was posted on May 16, 2018, in Blog and tagged New York State Museum, Suffrage Wagon News Channel. Be part of our information network at Suffrage Centennials! All the suffrage news that fits, we publish. And Suffrage Wagon News Channel is a source beyond all sources. The wagon’s associated press is there on the scene when there are developments on the suffrage centennial front. It’s getting more intense as 2020 approaches. That’s when American women will have been voting for 100 years. Keep current with suffrage centennial news. Subscribe by email or Twitter. Suffrage Wagon News Channel is behind the scenes with our collective ears to the ground to bring you suffrage centennial news. Now and forever, as long as it takes. This entry was posted on May 16, 2018, in Blog and tagged 2020, Inez Milholland, Suffrage Martyr, Suffrage Wagon News Channel. 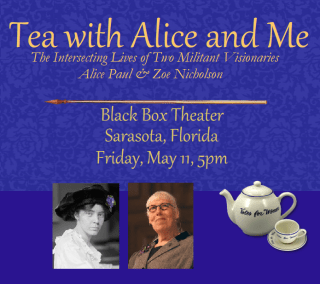 Alice Paul tea program to be presented in Sarasota, Florida after premier in California! Wild West Women is the proud producer of “Tea with Alice and Me,” a full-length one-woman performance that takes the audience to women’s tearooms ~ Seneca, Selfridges, The National Women’s Party, Women’s Bookstores. Of course it is really about a cup of revolution served up in nonviolent direct action. From 1775 through today, Zoe Nicholson takes you on her militant, revolutionary, feminist call to action. Hundreds of pictures and personal stories transport the audience to each time and place she describes. SuffrageCentennials.com has been publishing for five years to bring you the news and views of suffrage centennial events and celebrations across the United States. Marguerite Kearns is editor. Follow by signing up when we share new posts. Suffrage Wagon News Channel (SuffrageWagon.org) is a sister site to Suffrage Centennials. SWNC has been publishing since 2009. This entry was posted on May 8, 2018, in Blog, Events and tagged Alice Paul, Suffrage Wagon News Channel, Wild West Women. The Women’s March is scheduled for January 21, 2017 in Washington, DC. Find out about the details. 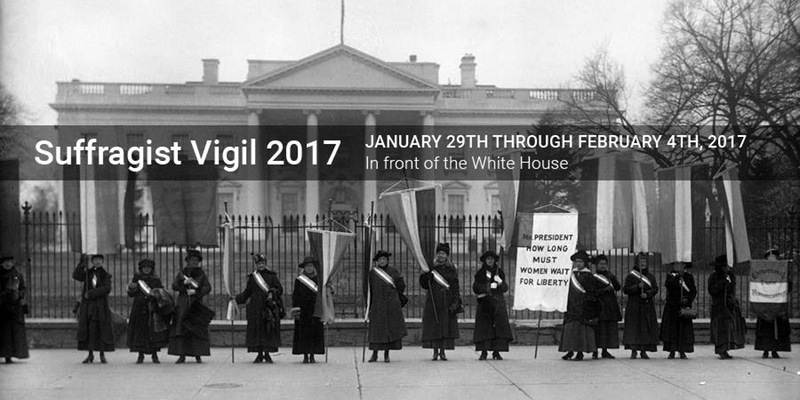 A vigil directly inspired by the U.S. women’s suffrage movement is scheduled for late January, from Sunday, January 29, 2017 through Saturday, February 4, 2017, EST at the United States Congress, the Supreme Court, and the White House in Washington, DC. IN OTHER NEWS: Check with the InezMilhollandCentennial.com web site for updates about the pending nomination of Milholland for a presidential citizens medal. The Suffrage Wagon Cafe has been posting programs about our national suffrage martyr, Inez Milholland. This entry was posted on January 3, 2017, in Blog and tagged 2017 suffrage centennial, suffrage centennials, Suffrage Wagon Cafe, Suffrage Wagon News Channel, vigil, womens suffrage. 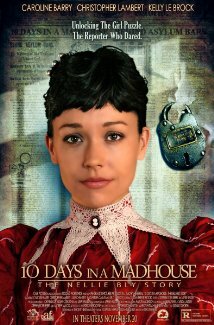 10 Days in a Madhouse Trailer from TriCoast Studios on Vimeo. A Nellie Bly special: Trade Cards from the collection of Kenneth Florey on Vimeo. The film, “10 Days in a Madhouse,” opens in theaters across the U.S. soon. It’s a staggered release so don’t give up if it’s not playing right away in your town or city. Be patient. It’s worth the wait. And our video features vintage Nellie Bly trade cards from the collection of author Kenneth Florey. It’s a reminder of how reporter Nellie Bly was well known in her day. Ken is the author of American Woman Suffrage Postcards from McFarland Press (2015). He specializes in women’s suffrage memorabilia, and his books are worth ordering to make them part of your reference library. WHY “10 DAYS IN A MADHOUSE” IS MAKING PEOPLE PAY ATTENTION! Come January 2016 with the upcoming Academy Awards, the film “10 Days in a Madhouse” is likely to be talked about as a U.S. film with teaching and learning potential because of the period subject matter and a more than 90% women’s cast. The film that’s directed by Timothy Hines and produced by Susan Goforth brings to a wide audience the story of investigative reporter Nellie Bly. 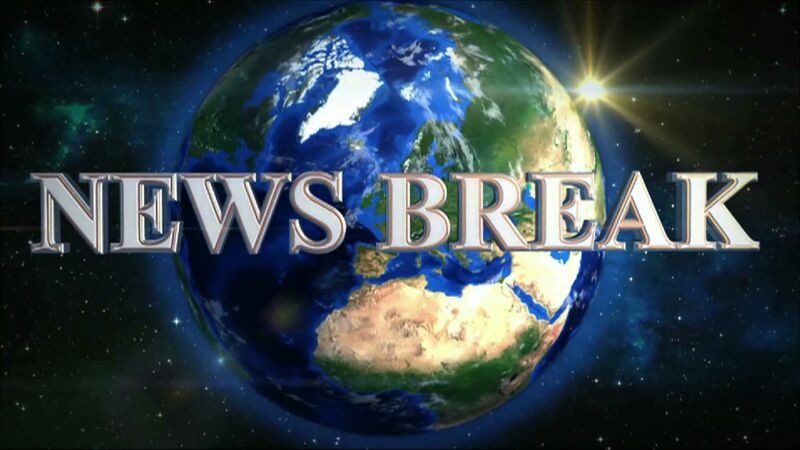 The cast includes Caroline Barry, Christopher Lambert, Kelly LeBrock, Julia Chantrey and others (Pendragon Pictures). In this production, Nellie Bly goes undercover in 1887 to report on conditions at Blackwell’s Island, a mental institution. Her expose created waves all over the nation. And Nellie Bly opened the doors wide for women in journalism before the turn of the 20th century. We love Nellie Bly because of her women’s rights activism and her journalistic coverage of the suffrage movement that included a remarkable interview with Susan B. Anthony, her feature articles on suffrage conventions, as well as the 1913 suffrage parade in Washington, DC. EXCLUSIVE INTERVIEW WITH NELLIE BLY FILM’S PRODUCER AND DIRECTOR! 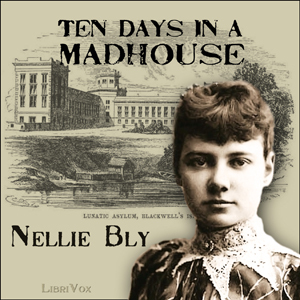 TEACHING RESOURCES: Librivox has “10 Days in a Madhouse” in audio. It’s free. 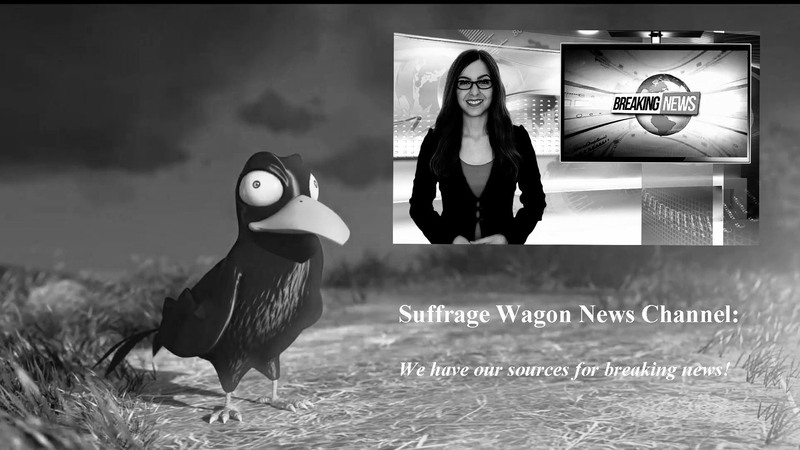 A shorter selection is available, edited by Suffrage Wagon News Channel. This entry was posted on November 8, 2015, in Blog and tagged 10 Days in a Madhouse, Nellie Bly, New York, suffrage history, Suffrage Wagon Cafe, Suffrage Wagon News Channel, suffragettes. July is the month to celebrate the 1848 Women’s Convention in Seneca Falls, New York. 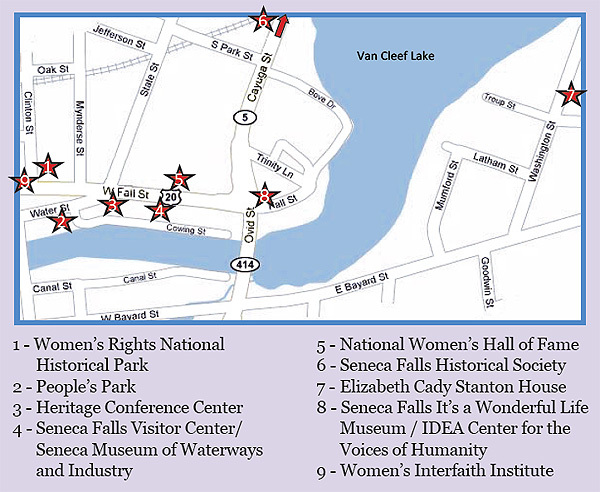 And if you’re planning to visit Seneca Falls, NY for the annual three-day celebration, note the dates. July 17, 18, and 19, 2015. Consult the Convention Days web site for the daily schedule. And then start by listening to the short podcasts from Elizabeth Cady Stanton reporting from her early days living in Seneca Falls, NY up to the point of the July 1848 convention and after. And now the entire audio series of “Trouble Brewing in Seneca Falls.” Podcast #1. Podcast #2. Podcast #3. Podcast #4. Podcast #5. Podcast #6. Podcast #7. Audio by Librivox. Production by Suffage Wagon News Channel. The June program of Suffrage Wagon Cafe featured visiting Seneca Falls, NY with videos, audio, and recommendations for travelers. Take note of the special report on the 1848 Seneca Falls convention on SuffrageCentennials.com Visit our TRAVEL link with travel notes and recommendations. 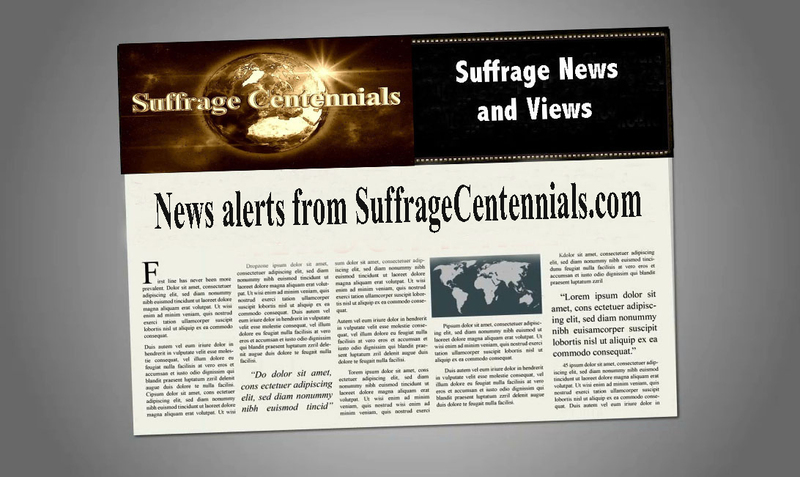 Follow SuffrageCentennials.com on Facebook page, Twitter, email subscription, and the Quarterly Newsletter. Sign up for email on this web page. Stay up to date with postings, audio podcasts, and videos. Plan for your suffrage centennial event with Suffrage Centennials Vimeo channel. This entry was posted on June 26, 2015, in Blog and tagged Elizabeth Cady Stanton, Seneca Falls Convention, suffrage history, Suffrage Wagon News Channel, womens suffrage. NEWS BREAK: The proposed Harriet Tubman national park might fit on Santa’s sleigh this year! This entry was posted on December 5, 2014, in Blog and tagged Harriet Tubman, Harriet Tubman National Park, suffrage centennials, Suffrage Wagon News Channel, womens suffrage.